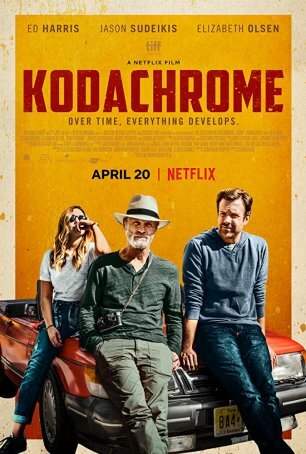 Kodachrome is proof of the concept that solid direction and superlative acting can transform even a mediocre script into something worth watching. At its heart, Kodachrome is a middling road picture – a film whose every plot point is predictable. If you guessed at the beginning how it’s going to end, you’d likely be correct. Narratively, there are few (if any) surprises and the key relationships develop without twists or turns. Yet, like a well-made romantic comedy that follows all the rules, Kodachrome engages because the dialogue pops and the actors are sufficiently invested that they give breadth and depth to characters who are, for the most part, underwritten. It can be hard for a road trip to win me over. Most of the time, I find them to be sluggish and uneven. Kodachrome is different, however, in part because it isn’t all about the journey. It’s often said that, in road trip movies, the destination is largely meaningless. That’s not the case here. We learn a lot at the final stop and that’s where more than one thing is resolved. Sure, the in-between episodes are important but the movie doesn’t treat its final act like an afterthought. The movie takes place during the summer of 2010. The journey begins in the New York area and ends in Parsons, Kansas, where the final Kodak-certified processing facility for Kodachrome is about to stop printing pictures. Ben Ryder (Ed Harris), a renowned photographer with a distaste for digital and a distrust of FedEx, has discovered four undeveloped rolls of Kodachrome and contacted Dawyne’s Photo to make arrangements for getting them printed on “the last day.” To do so, he must transport them there. Dying from liver cancer and too frail to make the trip alone, he is accompanied by his loyal nurse, Zooey (Elizabeth Olsen). His estranged son, Matt (Jason Sudeikis), is also in the car, with the tension between father and son often threatening to erupt into open warfare. Zooey plays peacemaker and, in the process, something begins to develop between her and Matt. Stops along the way include a final visit to Ben’s brother (Bruce Greenwood) and a concert in Chicago where Matt, a talent evaluator for an independent record label, is hoping to sign a band. Director Mark Raso (Copenhagen) has an easy, unforced style that allows lengthy takes by minimizing cuts. He also wisely gives his actors room to breathe. Jason Sudeikis, sufficiently separated from the limitations of his stand-up/Saturday Night Live past, has developed into one of the best working character actors today; his range is on full display here. He’s a lost soul, trying desperately to reconcile his feelings for a man who abandoned him but still retains power over his emotions. Ed Harris is at his crusty best, yet the defining scene is one in which Ben lets down his guard and allows the pain to come pouring out. The material is cliched but its impact is nevertheless powerful. Elizabeth Olsen does the best she can with a role deserving of more screen time and expansion. Her part feels more functional (first as a buffer between Ben and Matt, then as a quasi-love interest) than three dimensional. Kodachrome is a laid-back film for viewers who want to spend a couple of hours with “lived-in” characters. Ben and Matt seem like they have been around long before the movie began and we’re stepping in to see the final act of their relationship. This isn’t a movie where plot matters much, especially since we see where everything is going and understand how things will progress before they end. See the movie for Ed Harris and Jason Sudeikis (and, to a lesser extent, Elizabeth Olsen). They breathe life into Ben and Matt and give us a reason to care about them. Despite using a worn and oft-traveled route, Kodachrome is a trip worth taking.